Built as a light cruiser under yard No 36 by the Kaiserliche Werft in Kiel for the Imperial German Navy. 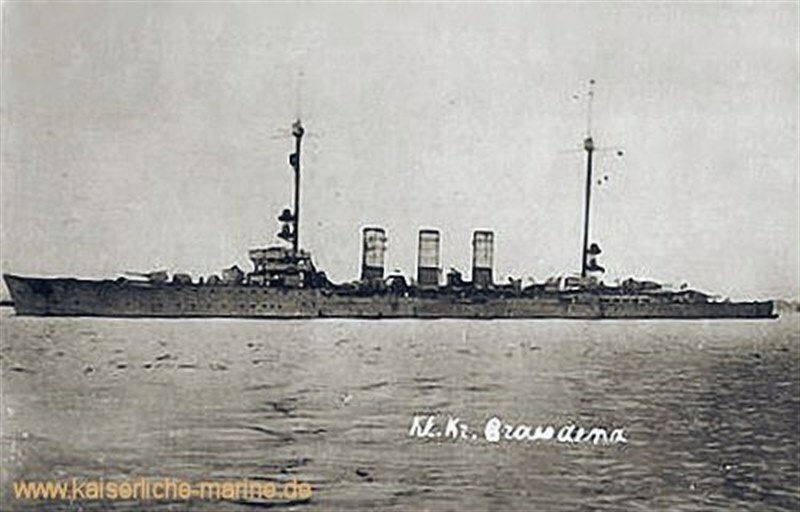 25 October 1913 launched as the GRAUDENZ, named after the town Graudenz now Grudziad in Poland. Displacement 4,912 ton, 6,382 full load, dim. 142.70 x 13.80 x 5.75m. (draught). Powered by two steam turbines, 26,000 shp (19,000 kW) 2 shaft, speed 27.5 knots. Range by a speed of 12 knots, 5,500 mile. Armament when built: 12 – 10.5 cm SK L/45 guns, 2 – 50 cm torpedo tubes. Crew 21 officers and 364 men. Both ships saw extensive service during World War I, primarily in the reconnaissance forces of the High Seas Fleet. They participated in several raids on the British coast, screening for the battlecruisers of the I Scouting Group. REGENSBURG saw heavy combat at the Battle of Jutland, the largest naval battle of the war; GRAUDENZ had been damaged by a mine and was in dock for repairs at the time of the battle. Both were involved in the Wilhelmshaven mutiny at the end of the war. Following Germany's defeat, GRAUDENZ was ceded to Italy and served as ANCONA until 1937, when she was sold for scrap. REGENSBURG was transferred to France, where she served as STRASBOURG until 1936, when she was converted into a barracks ship. She was ultimately scuttled in Lorient to protect the German U-boat pens there. The ships of the Graudenz class were 139 meters (456 ft) long at the waterline and 142.70 m (468 ft 2 in) long overall. They had a beam of 13.80 m (45 ft 3 in) and a draft of 5.75 m (18 ft 10 in) forward and 6.08 m (19 ft 11 in) aft. They displaced 4,912 metric tons (4,834 long tons) at designed displacement and 6,382 t (6,281 long tons) at full combat load. The ships' hulls were constructed with longitudinal steel frames and contained seventeen watertight compartments and a double bottom that extended for forty-seven percent of the length of the keel. The two vessels each had a standard crew of twenty-one officers and 364 enlisted men. While serving as a second command flagship or a flotilla leader, they had an additional three officers and fourteen enlisted men for the commander's staff. They carried a number of smaller boats, including one picket boat, one barge, one cutter, two yawls, and two dinghies. 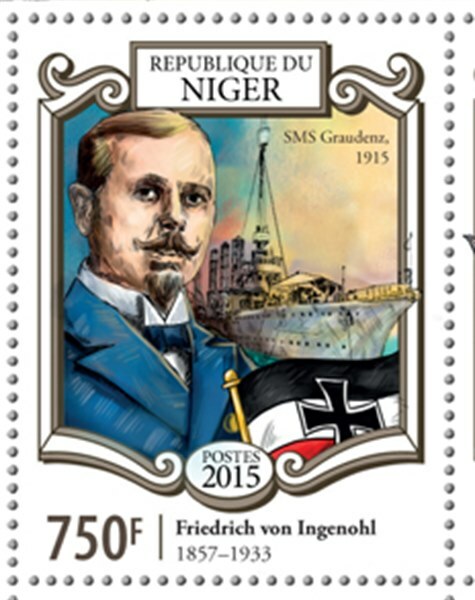 The German Navy regarded the ships as good sea boats, with slight weather helm and gentle motion in a swell. The cruisers were maneuverable, but were slow going into a turn. Steering was controlled by a single large rudder. They lost speed only slightly in a head sea, but lost up to sixty percent in hard turns. They had a transverse metacentric height of 0.79 m (2 ft 7 in). The ships' propulsion system consisted of two sets of Marine-type steam turbines, each of which drove a three-bladed screw 3.50 m (11 ft 6 in) in diameter. Each turbine was divided into its own engine room. They were designed to give 26,000 shaft horsepower (19,000 kW). These were powered by ten coal-fired Marine-type water-tube boilers and two oil-fired double-ended boilers, divided into four boiler rooms on the centerline. These gave the ship a top speed of 27.5 knots (50.9 km/h; 31.6 mph). The ships carried 1,280 t (1,260 long tons; 1,410 short tons) of coal, and an additional 375 t (369 long tons; 413 short tons) of oil that gave them a range of approximately 5,500 nautical miles (10,200 km; 6,300 mi) at 12 knots (22 km/h; 14 mph). At 25 knots (46 km/h; 29 mph), the range fell considerably, to 1,000 nmi (1,900 km; 1,200 mi). Each ship had two turbo generators and one diesel generator with a combined output of 260 kilowatts (350 hp) at 220 Volts. The ships were armed with twelve 10.5 cm SK L/45 guns in single pedestal mounts. Two were placed side by side forward on the forecastle, eight were located amidships, four on either side, and two in a super firing pair aft. The guns had a maximum elevation of 30 degrees, which allowed them to engage targets out to 12,700 m (13,900 yd). These were replaced with seven 15 cm SK L/45 guns and two 8.8 cm (3.5 in) SK L/45 anti-aircraft guns in 1916 for GRAUDENZ and 1917 for REGENSBURG. They were also equipped with a pair of 50 cm (19.7 in) torpedo tubes with five torpedoes submerged in the hull on the broadside. Two deck-mounted launchers were added for GRAUDENZ when the gun armament was upgraded; REGENSBURG had her submerged tubes removed and four deck mounted launchers installed. Both ships could also carry 120 mines. The ships were protected by a waterline armored belt that was 60 mm (2.4 in) thick amidships and 18 mm (0.71 in) thick on the bow. The stern was unarmored. The deck was covered with up to 60 mm thick armor plate forward, 40 mm (1.6 in) thick amidships, and 20 mm (0.79 in) thick aft. Sloped armor 40 mm thick connected the deck and belt armor. The conning tower had 100 mm (3.9 in) thick sides and a 20 mm thick roof. A rangefinder was added with 30 mm (1.2 in) thick steel plating. The main battery guns had 50 mm (2.0 in) thick gun shields. GRAUDENZ saw extensive service during World War I, including serving as part of the reconnaissance screen for the battlecruisers of the I Scouting Group during the raid on Scarborough, Hartlepool and Whitby in December 1914. The ship also took part in the Battle of Dogger Bank in January 1915, and the Battle of the Gulf of Riga in August 1915. She had been damaged by a mine and was unable to participate in the Battle of Jutland in May 1916. She was assigned to the planned final operation of the High Seas Fleet in October 1918, weeks before the end of the war, but a major mutiny forced the cancellation of the plan. After the end of the war, the ship was ceded to Italy as a war prize and commissioned into the Italian Navy as ANCONA; she remained in service until 1937 when she was stricken and broken up for scrap in 1938. Niger 2015 750F sg?, scott?